Polymer Cement Mortar (PCM) possess higher flexural and ductility, impermeability and higher adhesion with substrate concrete compared with normal cement mortars. Therefore PCM has been used widely in all kinds of anticorrosive projects and as repairing materials for concrete structures and pavement. In the PCM applications, the bond between the PCM and concrete usually presents a weak link in the repaired structure. 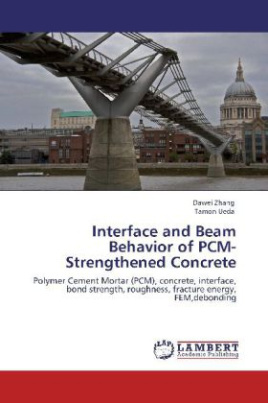 This research comprises experimental, analytical and numerical investigations of PCM-concrete bond properties subjected to static loading and fatigue loading. Various types of concrete substrates with different compressive strengths were prepared to simulate the actual bonding situation in real retrofitting fields. The concrete substrates surfaces were treated by water jet (WJ) method and the roughness was quantified with arithmetic mean value of roughness (Ra). Meanwhile, PCM overlay strengthened beams with different cross-section area of the strengthening bar were tested under monotonic flexure loading. The nonlinear FE analysis was carried out to simulate the debonding failure of PCM-strengthened beam and the debonding failure mechanism was further investigated.